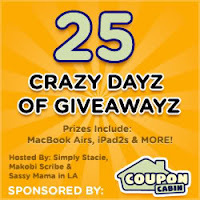 Please visit Simply Stacie, Makobi Scribe and Sassy Mama in LA to enter the giveaway and make sure to say Tsue ~ That's What She Said referred you! You can enter on all three sites or just one- it’s up to you! If you enter all three giveaways that just means more chances for you to win. 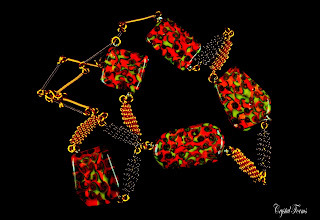 Beyond extraordinary, Crystal Forms exceptional jewelry is hand crafted of Borocillicate crystal, born of visionaries with master skill in the age old art of lamp working. Through the craftsmen special skills, transparent, opaque and coloured creations are brought to life with the use of flame torch: a process from which they create true fusions of art and culture. Mesmerizing and exquisite, capturing both the subtlety and vibrancy of the culture from which this work originates, donning such a piece has the ability to transport the mind. to lose yourself in the luxury and enchantment. Crystal Forms is generously offering That's What She Said readers an opportunity to win a $50 American Express Gift Card and further encourages you to explore upcoming Crystal Forms features on this site. This giveaway is open worlwide, to those 18 and up, and will conclude on November 26, 2011, 12:01am EST. 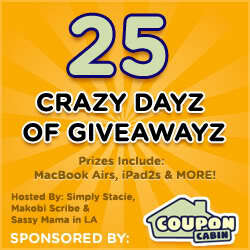 Enter the other blogs' giveaways in the CouponCabin’s 25 Crazy Dayz of Giveawayz by visiting the links below! 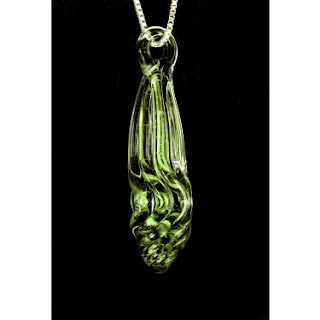 I have been honored to receive a stunning piece from Crystal Forms to explore for the purposes of creating a series of features regarding Crystal Forms. The opinions above are both honest and my own. Images and information sourced from various Crystal Forms sites. That's What She Said is responsible for shipping prize, but cannot be held responsible for lost or delayed mail. Facebook is not responsible for, nor involved in the giveaway in any fashion. The Blue Water piece from the Caribbean Collection is breathtaking! I am a water person at heart. I grew up in the south near the gulf. My son and daughter-in-law live on Galveston Island. I learned to swim so early that I don't remember, and I dunked my babies so early that they don't remember learning to swim--we just know how and love the water. So this Blue Water piece reminds me of that. I like the Triumph Necklace. It really makes a bold statement. I love the Carnival of Caribbean Life. So colorful and beautiful. I like the Sparkling Spring necklace from the Beach Collection. The coloring on it is beautiful, and the piece is very unique! I love the golden sand from the Caribbean Collection! The colors are just beautiful! I like the "Silk Sand" piece from the Beach Collection! It is dark and subtle, but still powerful and artistic. I love triumph from the royal collection. I just think it is so beautiful and unique and would look great with anything. I love the Marquess pendant. It's gorgeous! love the Diamond collection rock Crystal ring! I like Triumph from Royal collection! I love the rock crystal ring from the diamond collection. It is very different and I never seen anything like it. It is beautiful! I like the Countess Earrings...they are just stunning! I love the Sky's Reflection from the caribbean sands collection - it is absolutely stunning! i love the Grand Duchess Pendant. Too bad the price prevents in from ever being in my jewelry box. I love the Triumph from the Royal collection because I love the round feature and it is gorgeous! I like the Sparkling Spring Necklace from the Beach Collection because it is beautiful and reminds me of the ocean! I like the Sky's Reflection necklace from the Caribbean Life Collection because it's beautiful and my favorite color is blue. I like the Rock Crystal Ring (Clear) from the Diamonds collection, because it's sparkly and pretty and unique. love the triumph necklace from the royal collection. I like the Beach Collection Golden Sand because of the beautiful colors and lovely shape. My favorite is the Rock Crystal Ring (Clear) from the Diamonds collection. It caught my because it reminds me of all the beautiful jewelery the celebrities wear! What a hard decision! I really love Sky's Reflection from the Caribbean Collection. It reminds me of a blue swirling hurricane. It is so beautiful! I like the Royal collection- specifically the Duchess pendant. Great feeling of restrained movement. I am so in love with the Skys Reflection necklace. it is from their beach collection.I just went on a cruise to the western caribbean and this reminded me of the beautiful countries we saw and especially their oceans. The beautiful Virgo Nebula caught my eye. I like that it's black which adds elegance to the piece. And oooh boy it's expensive! Sparkling Spring from your Beach Collection it is absolutely gorgeous! i love the Sky’s Reflection it reminds me of the ocean. accidently put the wronge twiiter name on twitter follower tab..
Wow, I'm not sure words could really do these pieces justice. Absolutely amazing and breathtaking. After going from collection to collection and being left in awe, I think I would say the Virgo Nebula really caught my attention. (Which was hard to do with all the beauty each piece has) It is from the Bold Collection and makes me think of the evening sky and all the wonders that are in the universe. Simply divine. I love the Daisley in the Bold collection. Virgo Nebula is sooo beautiful! I love the Virgo Nebula from the Bold Collection! Why? Because reminds me of watching the stars, which is one of my favorite things about living in the country! My favorite is the Silk Sand piece from the Caribbean Life collection. It reminds me of glittery stones and it would go with anything. I love the Rock Crystal Ring (Gold)! Its so pretty and I love the pink color! My favorite piece is the St. Peters piece. I love the St. Peter necklace because of the blue detail. I like the Feathered Grapes from the Bold Collection. I like Triumph from the Royal Collection...I think it is beautiful & it would be a great statement piece to wear! I love the Silk Sand necklace from the Beach Collection. It looks like a starry night sky waaaay out in the country. Thanks! 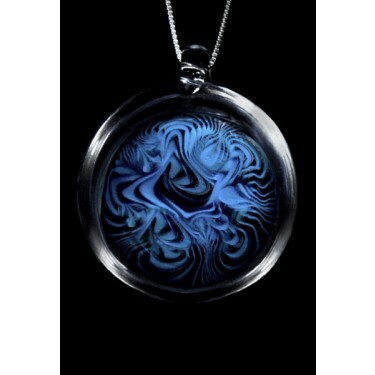 I like Sky's Reflection from the Beachy Collection because of the pretty swirling ocean blues. I love the Gold Rock Crystal ring from the Diamond collection and it caught my eye because of the huge shimmering splintered rock! I really love the victory necklace from the royal collection because it looks like something Princess Kate would wear and I admire her style! I like the Blue Water necklace from the Caribbean Life Beach Collection. I love to travel to the Caribbean and this reminds me of our vacations! I like all the pieces in the Caribbean Life Beach Collection, but the Sparkling Spring is my favorite. The color is my favorite shade of blue, and the necklace is gorgeous and unique. The angel of icicle earrings (diamond collection) are very nice! It reminds me of my favorite time of the year, which is winter. Oh my goodness, the Silk Sand in the Caribbean line is gorgeous. I love that it's so unique. Wow what beautiful work ~ I like the Sky's Reflection. The 'Silk Sand' piece from the Caribbean Life Beach Collection is beautiful. It looks so elegant, and kind of like stars. If I was lucky enough to pick a beautiful piece from them it would have to be the Countess Earrings they are gorgeous! Thanks so much for introducing me to the site! What beautiful pieces! I love the Rock Crystal Ring (Gold) from the Diamond Collection because it's unique and like nothing else I own. Sparkling Spring OMG it looks like my birth stone but way more natural and beautiful! Woooh Can I love them all ? :D One that you didn't show, that I think is gorgeous, is the Golden Sand pendant from the Caribbean Life collection. I think the colors are beautiful and I love how they swirl! I entered the Barbar Hair tools giveaway. I love St. Peter & Virgo Nebula in the Bold. The St. Peter is such a vibrant blue that is Gorgeous. 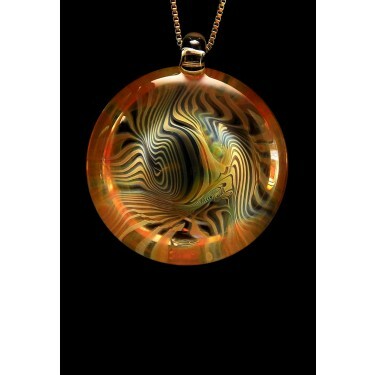 I love the Silk Sand pendant from the Carribean Life Collection. It caught my eye because it so stunningly beautiful and unique. O-M-G!!! Such gorgeous creations!!!!! I am in love with Virgo Nebula from the Bold collection. I love the sky, night sky especially. this necklace captures a piece of the sky and it is beautiful. I entered the Barbar Eco Friendly Hair tools giveaway. The rock crystal ring drom the diamond collection. I love rings and the colors caught my eye. My favorite is the Marquess Pendant from the royal collection because I love the color and regal shape of the pendant! My favorite piece is Sand & Sea from the Beach Collection because the name and colors remind me of home in Hawaii. I love the sky reflection from the carribean collection because it is beautiful! My favorite is the Triumph pendant. The color would go well with any outfit and it's beautiful. Thanks. I love the Rock Crystal Ring (Clear) from the Diamonds collection- super chic! I love the Virgo Nebula, it is extraordinary. I love the Blue Water from Caribbean Life - great colors! I absolutely love the Rock Crystal Ring (Clear) from the Diamond Collection. It is stunning, I just can't believe how gorgeous it is & how anyone could miss it! I LOVE the rock crystal rings! i so want one! I love the Sky's Reflections! beautiful! Wow what an amazing group of products! I really like the Grand Duchess pendant, it's my favorite color. I love all of their products though. The price tags are a little out of this world too. The St. John and Vergo Nebula necklace caught my eye. Great giveaway. Thanks. My favourite piece (and it was a hard choice since there were so many lovely pieces) was Sky’s Reflection. Absolutely gorgeous.